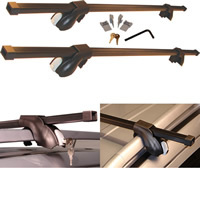 The Malone Universal Cross Bar is a very affordable roof rack system that fits nearly all factory installed side rails on virtually any vehicle make and model. Priced well below most competitive alternatives, the Malone Universal Cross Bar is a medium-duty rack that can transport kayaks, canoes, stand-up boards, surfboards, roof boxes, snowboards, skies, and bikes. Complete and ready to install, the Malone Universal Cross Bar fits all Malone and Thule accessories. There are no extra components to purchase or match; just simply determine which of three size options best fits your vehicle. Everything you need is in the box and can be installed on your vehicle in minutes. MPG201 is 1.25" x .9" x 50"
MPG202 is 1.25" x .9" x 58"
MPG202 is 1.25" x .9" x 65"